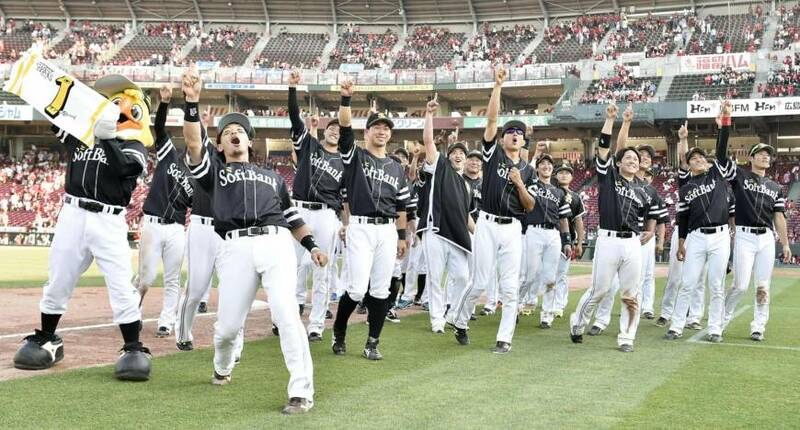 Hiroshima - The Fukuoka SoftBank Hawks remained the all-time kings of Nippon Professional Baseball’s interleague play on Sunday with a 7-4 win over the Central League-leading Hiroshima Carp. Although it was just a win in the overall scheme of things, both starting pitchers were on short leashes with the interleague title and a ¥10 million prize going to the winner or — in the case of a tie — to the Carp. The two teams finished at 12-6, but the Hawks got the nod with a better head-to-head record against the Carp. Takuya Kai broke a 1-1 tie in the second with an RBI single off Carp rookie Yuta Nakamura (3-1), who allowed a two-run single to Shuhei Fukuda before being yanked with two outs and two on in the inning. SoftBank lefty Hiroki Yamada was pulled after facing just 12 batters, making the way for a procession of six relievers. Allen Kuri allowed a run over 3⅓ innings in long relief for the Carp, but the CL champs could not gain any traction against SoftBank’s bullpen until Ryuhei Matsuyama’s pinch-hit two-run homer off Hawks closer Dennis Sarfate in the ninth. “This was a group effort,” Hawks skipper Kimiyasu Kudo said. “The advanced scouts, the coaches and the pitchers and hitters themselves did a great job analyzing our opposition. “We did this despite injuries to (captain Seiichi) Uchikawa and (slugging designated hitter Alfredo) Despaigne. The rest of the team did more than their share. Although one makeup game remains on the interleague calendar, the Pacific League is already assured of a winning record. In 13 years since interleague play was introduced, the CL has led in wins just once in 2008. Although the Carp failed to win first prize, they became just the second CL franchise to lead interleague play in winning percentage, following the Yomiuri Giants. At Jingu Stadium, Kohei Arihara (4-5) carried a one-hit shutout into the ninth, when he allowed three unearned runs. Sho Nakata scored twice, while Brandon Laird and Haruki Nishikawa each drove in two runs as Hokkaido Nippon Ham beat Tokyo Yakult. 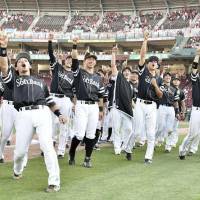 At Koshien Stadium, Takayuki Kishi (5-2) struck out eight in eight innings, repeatedly pitching out of jams to earn the win for Tohoku Rakuten. Takero Okajima singled in a run in the sixth and Yuki Matsui pitched out of a ninth-inning jam to close out Hanshin and collect his 21st save. At Nagoya Dome, Kyohei Kamezawa’s seventh-inning RBI single broke a 3-3 tie, and Chunichi’s top draft pick, Yuya Yanagi (1-2), earned his first career win after allowing three runs in seven innings. At Tokyo Dome, Yoshiyuki Kamei brought Yomiuri from a run down in the bottom of the 12th with a walk-off three-run home run to beat Chiba Lotte.